The number of used business jets for sale grew 3% in March compared to a year ago, while average list prices increased 3%, according to Jefferies. The used fleet for sale in March is 40% below its peak in October 2009. Inventory levels for sale during the month totaled 1,752 aircraft, compared to 1,697 in March 2018, equaling 7.6% of the total fleet, including all models and vintages. Heavy jets for sale declined 4% year-over-year with 365 jets on the market, compared to 379 a year ago. Medium jet inventories decreased 2% in March, representing 7.2% of the active fleet, while the number of light jets for sale rose 11%. The number represents 9.4% of the active fleet available for sale, compared to 8.6% a year ago, Jefferies said. “The used market inventory is likely to take time to bleed through and thus will impact new aircraft pricing,” Jefferies said. Jefferies forecasts new business jet deliveries to grow 8% in 2019 after a modest decline in 2018. It expects heavy jet deliveries to rise 29% in 2019 due to new model deliveries. Growth will be largely due to the Global 7500, G500 and G600, with a modest offset from lower deliveries of legacy models. Medium-size jet deliveries could rise 5% to 237 aircraft, Jefferies said, while light jet deliveries are expected to decline 6% year-over-year. 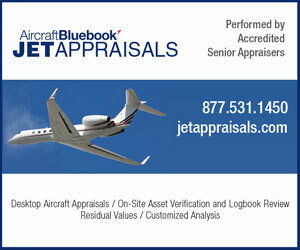 Aircraft Bluebook At-a-Glance has reviewed the current market status of the Gulfstream G550 business jet. Research for this study was obtained in part from Aircraft Bluebook, Aircraft Bluebook’s Historical Value Reference, the FAA’s registry web site and various trade services. The G550 fleet sits at approximately 564 active aircraft. At the time of this writing, approximately 20 G550s, representing approximately 3.3 percent of the active fleet, were reported for sale. Last year, approximately 40 sales appear to have occurred with the days on market ranging anywhere from 200 to 250+ days.